The Texas Department of Transportation (TxDOT) installs and maintains STOP (R1-1) and YIELD (R1-2) signs on all county road and street approaches to intersections with state highways outside of incorporated cities. These signs are maintained to the same standards as other state maintained signs. Section 545.154 of the Texas Transportation Code requires access or feeder road (frontage road) traffic to yield the right of way to traffic entering an on-ramp or leaving an off-ramp on controlled access highways. 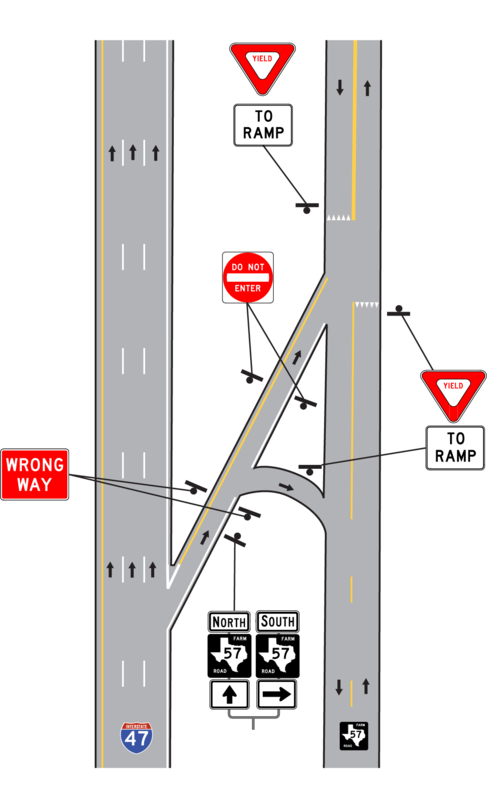 However, YIELD signs are not necessary and are not recommended where a free lane is available to off-ramp traffic and neither traffic needs to yield (see Figure 5-1 and Figure 5-2). The law also applies in rural areas where two-way frontage roads exist. 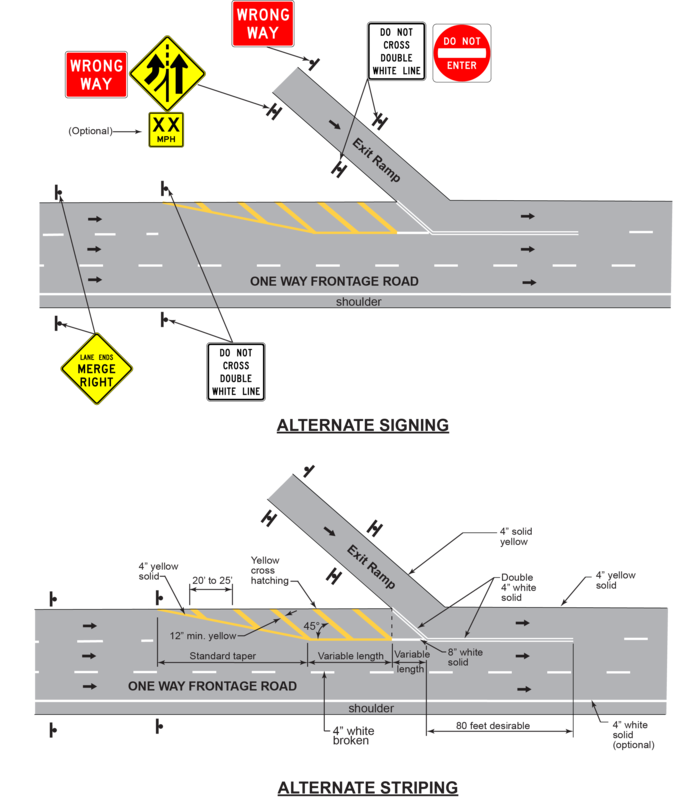 TxDOT interprets the law requiring frontage-road traffic to yield the right of way to traffic entering or exiting a controlled access highway to exclude locations where ramps to and from a controlled access facility directly intersect another state designated highway that appears to function as a frontage road. This situation occurs most commonly in areas where the freeway or expressway was built parallel and in close proximity to an existing designated route or where the freeway interchanges with a business route serving a community bypassed by the main lanes. In these instances, the business route or parallel facility should be a separate route and should not be considered an "access" or "feeder" road of the freeway or expressway. The traffic control incorporated at ramp intersections with this type facility should be the same as used at other ramp-crossroad intersections; that is, traffic demands should dictate right-of-way assignment. 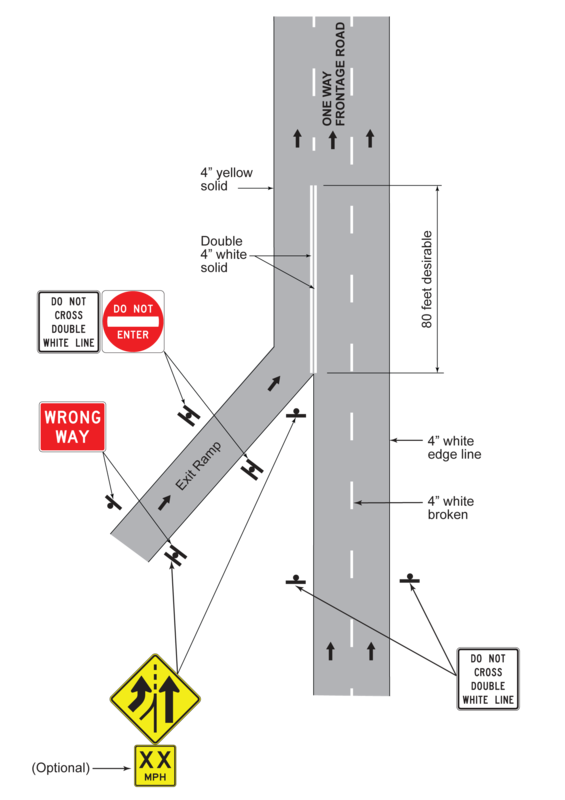 Where STOP or YIELD signs are placed on exit ramps that intersect a separately numbered highway route which appears to serve as a frontage road, proper route marker assemblies should also be used on the ramp. This exception applies only to ramp intersections with facilities that have route designations different from that of the main lanes of the controlled access highway, are listed separately in the road inventory log, and have a separate control section and reference marker (See Figure 5-3).